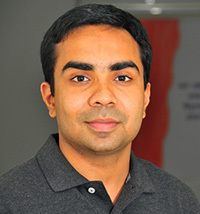 Dr. Chalil Madathil’s area of expertise is in applying the knowledge base of human factors engineering to the design and operation of sustainable human-computer systems that involve rich interactions among people and technology. His research covers the entire spectrum of system design: from identifying the user needs to designing and developing computing systems that inform and motivate user behavior and empirically evaluating the efficacy of these interventions. Using qualitative and quantitative methodologies, his research attempts to understand how humans perceive, make sense of, and interact with human-machine systems. His work is funded by the United States National Science Foundation, Office of Naval Research, Department of Defense, Department of Labor, National Institutes of Health and several other industry and state agencies. Chalil Madathil, K. & Greenstein, J. S. (2019). An investigation on the role of inaccurate anecdotal information on the healthcare sensemaking process. Applied Ergonomics. 70, 269-278. Khasawneh, A., Rogers, H., Chalil Madathil, K., Bertrand, J., & Gramopadhye, A.K. (2019). An investigation of the human adaptation to latency in teleoperated multi-robot human-agent search and rescue teams. Automation in Construction, 99, 265-277. Agnisarman, S., Lopes, S., Chalil Madathil, K., Gramopadhye, A.K. & Piratla, K. (2019). A survey of automation-enabled human-in-the-loop systems for infrastructure visual inspection. Automation in Construction, 97, 52-76. Chalil Madathil, K., Greenstein, J. S. & Horan, K. (2019). Empirical studies to investigate the usability of text- and image-based CAPTCHAs. International Journal of Industrial Ergonomics, 69, 200-208. Bhargava, A., Bertrand, J., Gramopadhye, A.K., Chalil Madathil, K., & Babu, S. (2018). Evaluating multiple levels of an interaction fidelity continuum on performance and learning in near-field training simulations. IEEE Transactions on Visualization and Computer Graphics. 24(4), 1418-1427. Agnisarman, S., Stanley, L. M., & Chalil Madathil, K. (2018). A survey of empirical studies on persuasive technologies to promote sustainable living. Sustainable Computing, Informatics and Systems. 19, 112-122. Agnisarman, S., Ponathil, A., Lopes, S., & Chalil Madathil, K. (2018). An investigation into a consumer’s choice of a healthcare facility when patient-generated anecdotal information is integrated into healthcare public reports. International Journal of Industrial Ergonomics. 66, 206-220. Chalil Madathil, K. & Greenstein, J. S. (2017). An investigation of the efficacy of collaborative virtual reality-based systems for remote moderated usability testing. Applied Ergonomics, 65, 501-514. Scharett, E., Chalil Madathil, K., Lopes, S., Rogers, H., Agnisarman, S., Narasimha, S., Dye, C. (2017). An investigation of the information sought by caregivers of Alzheimer’s patients on online peer support groups. Cyberpsychology, Behavior, and Social Networking. Agnisarman, S., Narasimha, S., Chalil Madathil, K., Gramopadhye, A.K. & McElligott, J.T. (2017). Designing home-based telemedicine systems for the geriatric population: An empirical study. Telemedicine and e-Health: The Journal of the American Telemedicine Association. Agnisarman, S., Narasimha, S., Chalil Madathil, K., Welch, B.M, Fnu Brinda, Ashok, A., & McElligott, J.T. (2017). Towards a more usable home-based video telemedicine system: A heuristic evaluation of the clinician user interfaces of home-based video telemedicine systems. Journal of Medical Internet Research - Human Factors. 4(2), e11. Rogers, H., Chalil Madathil, K., Agnisarman, S., Narasimha, S., Welch, B., Ashok, A., & McElligott, J.T. (2017). A systematic review of the implementation challenges of telemedicine systems in ambulances. Telemedicine and e-health: The Journal of the American Telemedicine Association. Agnisarman, S. O., Chalil Madathil, K., Smith, K., Ashok, A., Welch, B., & McElligott, J. T. (2017). Lessons learned from the usability assessment of home-based telemedicine systems. Applied Ergonomics, 58, 424-434. Narasimha,* S., Agnisarman,* S.O., Chalil Madathil, K., Roger,* H., Welch, B., Ashok, A., Nair, A. & McElligott, J.T. (2017). Designing telemedicine systems for geriatric patients: a review of the usability studies. Telemedicine and e-health: The Journal of the American Telemedicine Association. 23(6), 459-472. Parmar, D., Bertrand, J., Babu, S. V., Chalil Madathil, K., Zelaya, M., Wang, T., … Frady, K. (2016). A comparative evaluation of viewing metaphors on psychophysical skills education in an interactive virtual environment. Virtual Reality, 20(3), 141–157. Chalil Madathil, K., Rivera-Rodriguez, A. J., Greenstein, J. S., & Gramopadhye, A. K. (2015). Healthcare information on YouTube: a systematic review. Health Informatics Journal, 21(3), 173-194. Sanderson, I. C., Obeid, J. S., Chalil Madathil, K., Gerken, K., Fryar, K., Rugg, D., ... & Moskowitz, J. (2013). Managing clinical research permissions electronically: A novel approach to enhancing recruitment and managing consents, Clinical Trials, 10(4), 604-611. Chalil Madathil, K., Koikkara, R., Obeid, J., Greenstein, J. S., Sanderson, I., Fryar, K., Moskowitz, J. & Gramopadhye A. K. (2013). An investigation of the efficacy of electronic consenting interfaces of research permissions management system in a hospital setting. International Journal of Medical Informatics, 82(9), 854-863. Ponathil, A., Ozkan, F., Bertrand, J., Welch, B. & Chalil Madathil, K (2018, October). New approaches to collecting family health history – A preliminary study investigating the efficacy of conversational systems to collect family health history. In Proceedings of the 2018 Human Factors and Ergonomics Society Annual Meeting, Philadelphia, PA.
Narasimha, S., Scharett, E., Bertrand, J. & Chalil Madathil, K. (2018, October). WeRSort: Preliminary results from a new method of remote collaboration facilitated by fully immersive virtual reality. In Proceedings of the 2018 Human Factors and Ergonomics Society Annual Meeting, Philadelphia, PA.
Agnisarman, S., Ponathil, A., Lopes, S., & Chalil Madathil, K. (2018, October). An empirical study investigating the effectiveness of integrating anecdotal patient experiences into healthcare public reports. In Proceedings of the 2018 Human Factors and Ergonomics Society Annual Meeting, Philadelphia, PA.
Ponathil,* A., Agnisarman,* S., Narasimha,* S., & Chalil Madathil, K. (2017, October). “An Empirical Study Investigating the Effectiveness of Decision Aids in Supporting the Sensemaking Process on Anonymous Social Networks.” In Proceedings of Human Factors and Ergonomics Society’s International Annual Meeting, Austin, TX. Rogers,* H., Khasawneh,* A., Bertrand, J. & Chalil Madathil, K. (2017, October). “An Investigation of the Effect of Latency on the Operator’s Trust and Performance for Manual Multi-robot Teleoperated Tasks,” In Proceedings of Human Factors and Ergonomics Society’s International Annual Meeting, Austin, TX. Bertrand, J., Bhargava, A., Chalil Madathil, K., Gramopadhye, A.K. & Babu, S. (2017, March). The Effects of Presentation Method and Simulation Fidelity on Psychomotor Education in a Bimanual Metrology Training Simulation,” In Proceedings of 2016 IEEE Symposium on 3D User Interfaces (3DUI), Los Angeles, CA. Bertrand, J., Brickler, D., Babu, S., Chalil Madathil, K., Zelaya, M., Wang, T., Wagner, J. Gramopadhye, A. K. & Luo, J. (2015, May). The role of dimensional symmetry on bimanual psychomotor skills education in immersive virtual environments. In Proceedings of the Virtual Reality Conference, 2015, IEEE VR 2015, Provence, France. Chalil Madathil, K., Greenstein, J. S. & Koikkara, R. (2014, October). An investigation of the factors that predict a healthcare consumer’s use of anecdotal information available on the internet. In Proceedings of the 2014 Human Factors and Ergonomics Society’s International Annual Meeting, Chicago, IL. Parmar, D., Bertrand, J., Shannon, B., Babu, S. V., Chalil Madathil, K., Zelaya, M., ... & Gramopadhye, A. K. (2014, March). Interactive breadboard activity simulation (ibas) for psychomotor skills education in electrical circuitry. In 2014 IEEE Symposium on 3D User Interfaces (3DUI), IEEE. Obeid, J., Gerken, K., Chalil Madathil, K., Rugg, D., Alstad, C., Fryar, K., Alexander, R., Gramopadhye, A. K., Moskowitz, J. & Sanderson, I.C. (2013, February). Development of an electronic research permissions management system to enhance informed consents and capture research authorizations data. In Proceedings of the AMIA Clinical Research Informatics Summit, San Francisco, CA. Chalil Madathil, K., & Greenstein, J. S. (2011, May). Synchronous remote usability testing: a new approach facilitated by virtual worlds. In Proceedings of the 2011 Annual Conference on Human Factors in Computing Systems (pp. 2225-2234). ACM. Dr. James L. Burati, Jr.